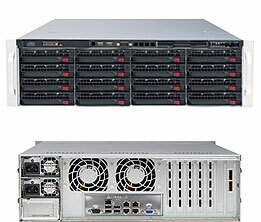 Supermicro 3U SuperStorage Server 6037R-E1R16L is designed for Compute Intensive Storage Environments such as Data Deduplication, Replication, Virtual Tape, NAS, IP-SAN, etc. Supermicro X9DRD-7LN4F-JBOD, E-ATX 12" x 13" (30.5cm x 33cm). Dual sockets of Intel® R, LGA 2011-Pin. Support 10BASE-T, 100BASE-TX, and 1000BASE-T with RJ-45 outputs. LAN: 4x RJ-45 ports for GbE LAN, 1x RJ-45 port for IPMI dedicated LAN. Serial Port: 1x Fast UART 16550 serial port/1 header. Buttons: Power On/Off, System Reset buttons. LEDs: Power, Hard drive, 2x Networking, System Overheat, & Power fail LED. AC Input: 100-240 V, 11-4.5 Amp, 50-60 Hz.